People in Morganton now have a new option for exercise. Stephen Jackson, who formerly owned the Family Dollar in the Independence Crossing Plaza on NC 181, wanted to bring a 24-hour gym to Morganton. 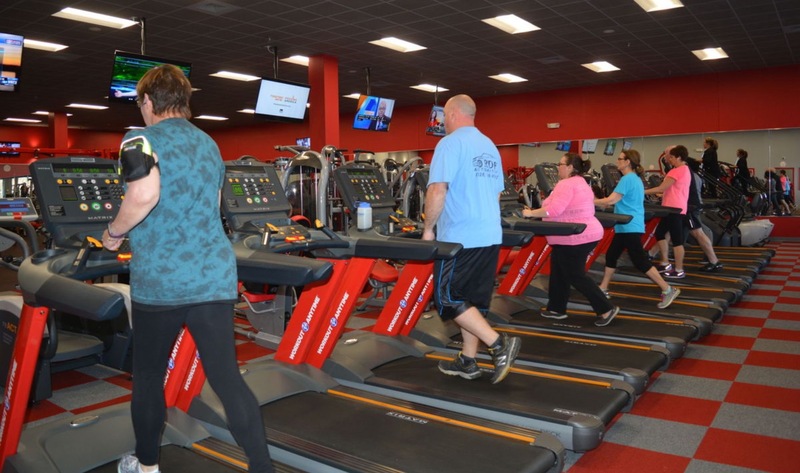 Workout Anytime opened this January in the same space, according to gym manager Josh Moses. “We wanted to create a gym atmosphere for the community where everybody felt comfortable and motivated to pursue their fitness goals regardless of experience level,” Moses said. The concept of Workout Anytime is that it is available to members on a 24-hours-a-day basis. The gym is staffed from 9 a.m. to 9 p.m. Members are given a key fob with a bar code they can scan at the door to get in the building anytime. An added bonus is that the key fob will work at any of Workout Anytime’s dozens of franchises across the country, so members can work out if they’re traveling as well. Moses said the gym stays busy around the clock as people take advantage of the 24-hour access. He said he’s seeing people of all demographics come through the door. He said employees who work second or third shift or a rotating schedule appreciate the ability to workout whenever they have time. Gym member Lawrence Robbins of Lenoir is one such employee. Amenities at Workout Anytime include cardio equipment, pin-loaded weight machines, free weights, hydro-massage and tanning, according to Moses. Moses said all memberships come with one free session with a personal trainer. Workout Anytime trainer Tyler Noble earned a bachelor’s degree in exercise science with a minor in kinesiology from Eastern Kentucky University. “He can get you on the right path and help you reach your goals,” Moses said. Angie Hefner of Nebo spoke about how Workout Anytime has helped her move closer to her fitness goals. Moses plans to hire another trainer soon to help lead small-group classes. He said both members and non-members of Workout Anytime can pay to take classes in different workout routines for $5 per class. “We do them in small groups because some people who are intimidated their first time in here, putting them in the group setting gives them reinforcement and group support, so it’s a lot more fun for them,” Moses said. He encouraged those looking to start a workout regimen to give Workout Anytime a try. The gym gives free three-day passes to first-time visitors. Tammie Gercken can be reached at tgercken(Replace this parenthesis with the @ sign)morganton.com.